Who Are We, If Not People of the Cross? #TellHisStory: Who Are We, If Not People of the Cross? It’s the faces. We won’t forget the faces. The set jaws, the stoic eyes. We can’t forget how they were paraded along the seashore. 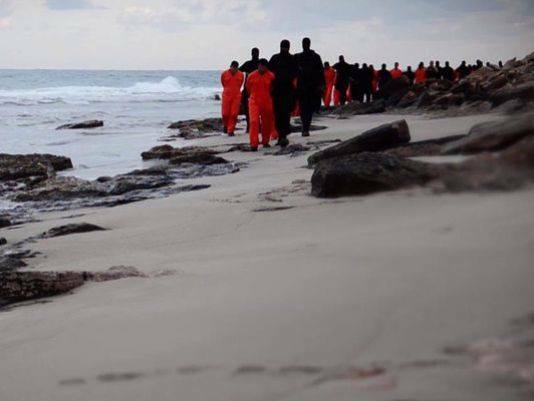 They were earnest, and on their knees, before their martyrdom, knowing that it was going to end right there, in the sand. There were 21 in all. Their alleged crime? Being Christian. I couldn’t sleep last night. I thought about my 21 brothers, and their families. And I thought about the men standing behind them, shrouded in black. The whole world is screeching with the deafening agony of sin. I prayed again and again last night: “Lord, have mercy. 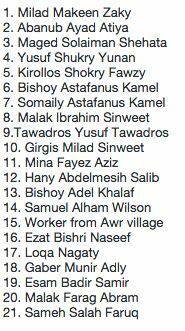 Lord, have mercy.” I prayed the names of the 21. And today, I wore an orange shirt. For my 21 brothers, and for every martyr, and for all the mayhem exploding around the world. 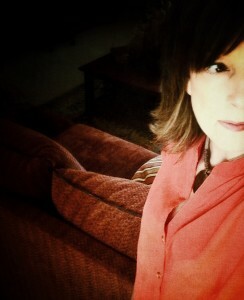 I wore orange for every person of the cross, and I wore it as a stubborn prayer for every person who is an enemy of it. I prayed that the enemies, wrapped in their black disguises, would become “Pauls” to the Arab world. We pray, because we are people of the cross. We have compassion — which means “to suffer with” — because we are people of the cross. And our cross is more powerful than any blade. I am a person of the Cross, and I speak of the cross, to let loose its resurrection energy. God, who changed everything on the cross, is our only hope. Some people will think we are the enemy. They will hide their faces, under black hoods, and they’ll carry knives and spears. 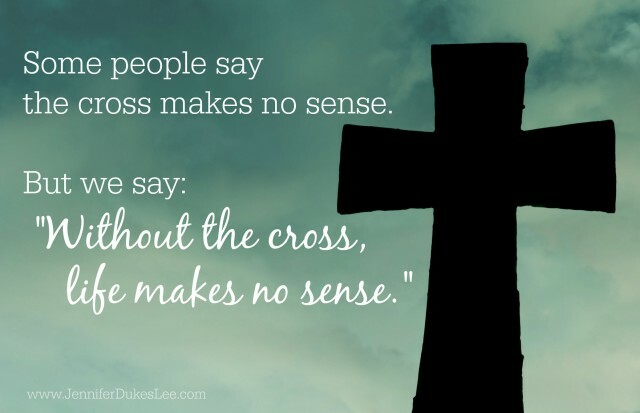 They’ll say the cross makes no sense. I’ll be gut-level honest. Part of me wants to crawl into a corner for the rest of 2015, lock the windows and bolt the doors. But who else are we than this: hope-filled children of the King, beggars at the foot of a cross? People who found the Light in our own dark nights? Who are we but this: People of the cross. Does any other label really matter? And on and on the flame goes, one candle at a time, bringing hope to a broken world in need of a real hero, the original cross-bearer, the sacrificial lamb. The orange flame flickers. The world may not believe in our King, but some are looking to see how we respond. They are not looking for platitudes or pat answers. They are looking for a Light, by which to see. They are looking for people who “suffer with,” for people who do not grieve as the world grieves. They need hope. We have that. For every brother who finds himself at the end of a spear, at the mercy of the sword-bearer, at the corner of a cell, on his last breath ... we cry out with you. Though we are separated far in miles, we are close in heart. We refuse to ignore. We refuse to look away. We remember you, as if we were WITH you. And we refuse to knuckle under. We are the ones who believe that no sword, no knife, no danger, no terror will separate us from God. We are inseparable from Christ. To some, the message of the cross is foolishness. In the end, it’s the only label that really matters. Starting this week, the #TellHisStory linkup goes live at 4 p.m. (CT), instead of midnight. Hey Tell His Story crew! It’s always a joy to gather here every week. You’re welcome to link up below. If you would use the badge on your blog, found here, that would be great. And if you would visit at least one other blogger in the link-up and encourage them with a comment, that would be beautiful! Be sure to check the sidebar later. I’ll be featuring one of you over there! Renee Griffin is our latest featured writer. Yes, sister. Yes. No words can express my sadness. So I will pick up my candle and rush in with you to let God light the way. My heart just aches with the reality of it all. I proclaim with you that I am a person of the cross and as I sit in my warm house today, shielded from the snow and bitter cold, I know that God asks more of me. He asks more than just simple words here in a comment. He asks that I share Him with all. He asks that I shine my light for Him and He asks that I share the cross. Praying we feel God’s strength as we step out in faith. Blessed by your words! Crying out with you over this horrific persecution, Jennifer. It amazes me what strength of faith these people have to stay true to Christ. I sometimes ask myself: Would I be so true in the same situation? I pray we all will continue to let Jesus’ light shine no matter what troubles come our way. My heart cried out all over again in reading this, Jennifer. When I first heard this horrid news, I felt as though my heart had been pierced. These are our brothers in Christ and we are people of the cross. May we shine the light of our Lord into this dark and hurting world. Blessings to you. I couldn’t sleep either, Jennifer. I spent the night wetting my pillow in prayer and asking Him to show mercy, mercy, mercy. I can’t fathom the depth of pain the surviving family is feeling and the ache even, in our soul as we watch those who are sealed with glory’s kiss being tossed and discarded as unworthy. It. breaks. my. heart. and it makes me mad to see such depravity and the ease we can have in looking over it and not looking at the names, the very names of those who meant so much to a momma, sister, brother, wife, father or child.. their life mattered, it mattered. Thanks for reminding us of the value of their lives, of the power we have to pray. I agree with you, with everything. Makes my little day to day troubles seem so insignificant. This is a big deal. The tide is shifting and winds of change are blowing. And God whispers to me as I am tempted to fear (twice today), “Let your light shine.” Maybe I need to wear my neon orange shirt too. As a testament to the Lord that He IS. Powerful thoughts today, and needful. I support you, sister. I have tried to write about these brave men and the words get caught behind the lump in my throat. Every time I see these pictures something deep inside of me just aches. Thank you for this reminder of the only label that truly matters. Let us wear it proudly and for his glory. Let us not have a Spirit of fear, but of love and sound mind. Bless you, sister. Jennifer, we agonize. Our hearts are ripped in two. Jesus’ heart was torn in two on the Cross. When none of the mayhem and murder and malice makes sense, you are right. The Cross is the only thing that does, because Jesus was willing to suffer and die a martyr’s death. We must cling to the Cross and to what comes after, as I know you do. Oh as I know you do. He’s risen. We only see Gethsemane now in the world shrouding around us and in this Church season, but we know Easter is already here. Because He has risen and paid the penalty for the sins of us all, we have true hope. Those who were beheaded in the sand already behold Him face to face in glory. May the risen Lord also comfort those who are bereaved beyond imagining at losing those they so dearly loved. And may those who have chosen violence and bloodshed turn to the One who shed His blood for them. The Cross is their only hope too. My question to myself is: Lynn, you have turned to the Christ of the Cross for salvation; would you be willing also to DIE for the Cross, for Christ in the same manner as those who have been martyred? Oh Jennifer. I tremble. I truly do. I pray that God would give me the same grace that He gave them. Bless you and thank you for wearing orange, for wearing your heart outside your chest where we can feel its beat better. After watching the news last night I couldn’t stop thinking about the innocent ones either. 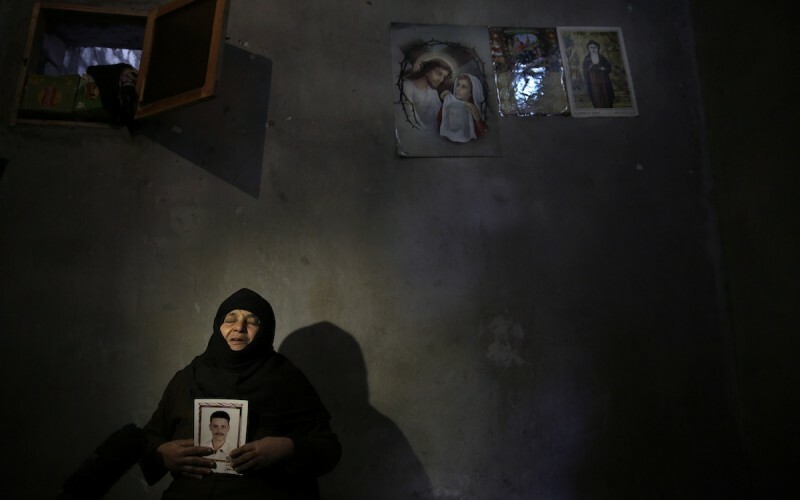 The men, women, children who happen to be born in such a spot of turmoil. We take so much for granted over here and sometimes it doesn’t feel right to live our lives while others share a road with tanks, men in black masks, rifles, machine guns, and the fear of the unknown happening at any moment. My heart was different today. I truly hope for a change and peace to come sooner than later…. I don’t have words tonight. Just standing bent beside you, friend. Let me always proclaim Jesus–come what may. Part of me wants to hide, too. To shut off the news, to ignore the world, to live behind my own doors happily ever after. I can only pray God gives me the courage of the cross. I love you. Yes sometimes I want to pull the covers over my head and stay cocooned in my little world of comforts…but God calls us out to care for our fellowmen. Thank you for the example of praying for our fellow brothers and sisters. And for praying for those who don’t know Christ our Savior. I needed to feel this piercing my heart with conviction. Thank you! impart to each of us the courage of the Cross. Grateful you shared this post. Thank you Jennifer, for writing on this topic. I live in the MidEast, and my heart has been heavy, so it has been so comforting to me to read others thoughts and prayers. Thank you. This is beautiful, Jennifer. I’m still trying to process it all, to wrap my head around what’s happening in our world. I feel the weight of the injustice of it all, and at the same time, a sense of the weight of glory: this is as Jesus told us it would be. We are the ones who have settled for vanilla Christianity, cocooned by our religious rights and isolated from the persecution our brothers and sisters face around the world, have been facing for the last 2,000 years, yet it’s been “out of sight and out of mind” for most of us. My heart grieves for the families who have lost their loved ones and at the same time aches for the many of us who have been slumbering all this time. May God bring a shaking of the ground and a revival of hearts, that we would gladly bear the name “people of the cross” even if that means being faced with beheadings in our own towns. Frightening, just the thought of it… and yet much closer to the reality Jesus promised us for our earthly lives. And then, an eternity in heaven, celebrating Jesus with #The21 and the many more who have gone before us. This story just breaks my heart so totally. 🙁 Thank you for sharing the 21 names. Powerful writing about powerful truth, Jennifer. I love your heart that thinks to pray for the black-shrouded murderers to become “Pauls.” That’s a Spirit-driven prayer, no doubt! I, too, was struck by the stoicism of those Christian men. Surely their captors saw the same. Do they wonder at the peace which surrounded the martyrs? Do they lie awake at night, pondering in the silence, “Am I on the side of truth, or are they?” Thank you for giving us so many ways to pray for our persecuted brothers and sisters world-wide AND for their persecutors. Thank you for kneeling in prayer with me, Nancy. Oh, Jennifer……all of this, yes. I so wish I had the gift you have of being able to put words to the confusion that strikes my heart when news like this goes viral. Thank you for putting it into words. I feel as though I’m groping for words, plucking them out of a fog of confusion. Thanks for being here, for praying with me. Thank you for this post. What eloquent words God has given you to what so many of us are thinking. Grateful for your heart here this week, Ginger. Letting loose the power of the cross – so compelling! I know I’m often guilty of that helpless feeling that gives into helpless prayer – the kind that believes that we’ll “just” pray. But there is so much power in being that hound to heaven and pursuing God as His people, for His people. Thank you for the powerful reminder today, Jennifer – that we are indeed people of the cross. Calling on God’s Resurrection power with you, Tiffany. Beautiful post! I too want to hide but I know the battle will continue to rage all around. I might as well take the spirit of the Lord that is my strength and be a light. May courage rest upon all people of the cross! Blessings to you! On my knees with you, Rachael. Praying, and believing. A post worth sharing around the world. We are people of the cross. We will have trouble in this world, but He has overcome the world. Thank you for the reminder. We live in community. When the body of Christ hurts we hurt together. Linking arms with you, Chris. Thank you for this wonderful post. Amen and amen!